This is the fourth article in our series called, Buying a Home 101: Everything You Didn’t Know You Needed to Know Before You Buy Your First Home. This step-by-step series will take you through the entire home-buying process — from finding a buyer’s agent to settlement day, and even to maintaining your home after you’re all moved in. Make sure to tune in every week! Buying your first home is probably the biggest investment you have ever made, and you definitely don’t want to wipe out your entire savings to purchase a home. Coming up with a lump sum of money for a down payment can be scary and daunting to many first-time buyers. It doesn’t have to be that way – we promise! 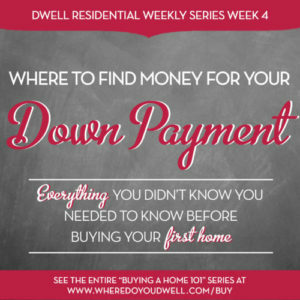 Once you’ve got your monthly budget all set and know approximately how much home you can really afford (see our third article in the series), the next step is dealing with your down payment. You don’t have to let it become a roadblock to homeownership. Here’s some guidance on where you can find cash for your down payment and also a rundown of some great homebuyer assistance programs that can help reduce the amount taken out of your own pocket. How much money you need for a down payment can depend on the type of mortgage you will get for your financing. Lenders of conventional loans may require 5%, 10% or 20% down, depending on your credit and other factors affecting your financial picture. FHA loans can require as little as 3.5% down. If you are a veteran, you can put 0% down! However, the amount you put down really depends on YOU. If you’re a first-time buyer, don’t put all of your savings into your house where you can’t touch it. You may need some of that cash once you’re a homeowner. Instead, put down just enough to buy the house and get a monthly payment that works for your budget right now. Don’t worry about the rest for your first home, since you will likely be in it for only a few years. These days, you don’t have to put 20% down to avoid paying monthly Private Mortgage Insurance (PMI). Monthly PMI is typically not tax deductible (check with your tax advisor since it depends on your situation), so most people want to avoid it. A smart strategy for first-time buyers — who don’t have 20% down OR who don’t qualify for a first-time homebuyer program that helps get them to 20% down — is to have your lender increase your interest rate just slightly. This small increase will hardly change your monthly payment but is enough to avoid the “risk” of PMI or the PMI becomes tax deductible. Once you narrow down your mortgage options and take into account any homebuyer assistance programs, you’ll have a better idea of how much you’ll actually need for your down payment. Next week we’ll help you sort through all the mortgage options out there. Stay tuned for that! As a first-time homebuyer, you may qualify for many of the state and local assistance programs out there, many of which could help cover some of your down payment. Plus, several lenders also offer grant programs that can help with down payment and closing costs. If you’re a first-time buyer with a moderate income, you should look into these programs before you consider other options. It’s like free money toward your purchase! Many assistance programs could be a good match for you and your circumstances. For example, if you’re a state, country or city employee, then many local jurisdictions want to make it possible for you to work and live in the same community. The District, for example, offers a few programs for certain buyers. There’s one where you could get up to $84,000 in down payment money when you buy a DC home. There are also zero down-payment options and a way to increase your tax deductions and even pay no property taxes! Other jurisdictions in Virginia and Maryland also have assistance programs. Most programs are income dependent but don’t think these programs are just for low-income earners. You can make up to $132,000 per year and could still qualify for these types of programs. We always keep up-to-date on the latest changes and can connect you to these assistance programs. We can work with you to determine what you qualify for based on your income and where you plan to buy a home. We’ll then help you with the next steps to take advantage of whatever programs you do qualify for. Should You Tap into Your Retirement Accounts? You may have a nest egg of cash that you thought was off limits! These options below may not be the best choice for you, but they are something to consider if funds are needed. Keep in mind, you will need to follow some set rules to access this money, and should always consult with an advisor to clearly understand any tax implications. Borrow From Your 401(k) Plan. Check with your employer to see if your 401(k) plan allows for loans. If you have less than $20,000 in the account, you can borrow the amount of your vested balance but no more than $10,000. (The maximum loan amount under the law is the lesser of one-half of your vested balance in the plan or $50,000.) Remember if you leave or lose your job, you may have to pay back the entire amount in 60 days or sooner. So be sure you understand any tax consequences, penalties and charges as well as repayment terms. More information about borrowing from your 401(k) here. Withdraw Funds From Your IRA. Usually, money in an IRA can’t be withdrawn before age 59 ½ without incurring a 10% penalty. However, you have no worries about a penalty if you’re a first-time buyer or someone who hasn’t owned a principal residence for two years prior to signing a binding sales contract. You can withdraw up to $10,000 penalty-free from an IRA for a down payment if you meet these requirements. If you and your spouse are both first-time buyers, each of you may pull from your retirement accounts, giving you a total of $20,000 in cash. Keep in mind, any withdrawals from a traditional IRA must be reported as income and taxes must be paid. This $10,000 is a lifetime limit — and must be used within 120 days of receiving it. Withdraw Funds From Roth IRA. The rules are a bit different if your nest egg is in a Roth IRA. The $10,000 you take out for your first home is a qualified distribution as long as you’ve had your Roth account for five years. This means you can take out your retirement money without penalty, and because Roth earnings are tax-free, you’ll have no IRS bill either. You might be reluctant to ask your family, but they can be a great source for your down payment. You will need to decide if this is a gift or a loan. Your parents might have done the same thing when they bought their first house! Gift from Family. Immediate family will often help with home purchases. Gifts up to $14,000 per year per person can be given without worrying about the gift tax. This means, for example, that every year your mother and father can give you and your spouse a total of $56,000 without having to file a gift tax return. Documentation is required so you need a letter stating that the money is indeed a gift with no expectation of repayment. Borrow from Family or Friends. You may prefer to ask for a loan rather than a gift from a loved one. However, your lender needs to know if you are borrowing from family or friends since they will consider this an additional debt for you. The lender will factor this additional debt into its own decision on whether to loan you money. This is one area where you have some control over and should start making an effort as soon as you even begin thinking about buying a home. The earlier you start, the more you can increase your personal savings. Tax Refund. Consider changing your withholding exemptions from 1 to zero. Your paycheck will be reduced but you’ll get a bigger check at tax time to use toward your down payment. That way you won’t use the money up during the year and will have a big chunk at the end. Deposit $ in Your Bank Regularly. You’ve probably heard this before, but it does work: Get into the habit of putting the same amount of money into your savings after every paycheck. If you get paid every two weeks and save $200 from every paycheck, you will have saved more than $5,200 after 12 months. Not bad! Sell Stuff on eBay or Craigslist. Everyone has unwanted items that take up space. Consider eBay or Craigslist to sell these items and put that money toward your down payment. Don’t really use that car? Maybe selling could be a way to get to your down payment, especially if your new home is near Metro or other transit options. Be creative! It’s important to remember that you don’t need as much for a down payment as you think. It doesn’t have to be a roadblock to homeownership. Depending on your income, it can be as little as zero. Yes, zero! Reach out to us and we can help you figure it out and formulate a plan from there! Even if it means you can’t buy for a year or so, at least you have a plan. Let us help you create it!